We have Just Sold out of Star Wars Rey Pop! Lanyard. Not to Worry! Fill in the Notify me When Available and you will be the first in line for our restock of Star Wars Rey Pop! Lanyard !! From the Star Wars The Force Awakens Pop! Vinyl collection by Funko. Star Wars Rey Pop! Lanyard. 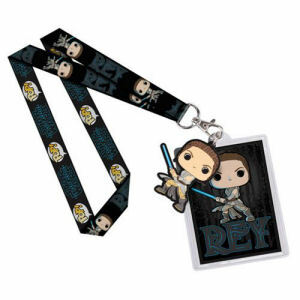 Lanyard includes a soft rubber charm and a badge holder. Charm measures approximately 2.5 inches long. Badge holder measures approximately 4.5 inches tall by 3.5 inches wide.